~Anytime we get together is our special time to knit. Picking a special location would be The Office aka Starbucks. Curl’s steaming hot decaf Americana and Q’s black iced tea, no water, no sweetener – what a way to start the day. Our bags are full of “stuff” to share with each other. 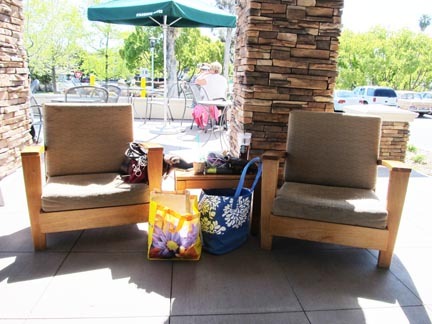 We move the chairs around to the perfect position so the sun isn’t in our faces. After all of the sharing and drinking and snacking (ok, we do get a snack), we pull out our knitting project. Curls is such a fast knitter that she is usually further along than Q. It helps that we do any new parts of the project together, especially with the Norwegian Star slipper project. 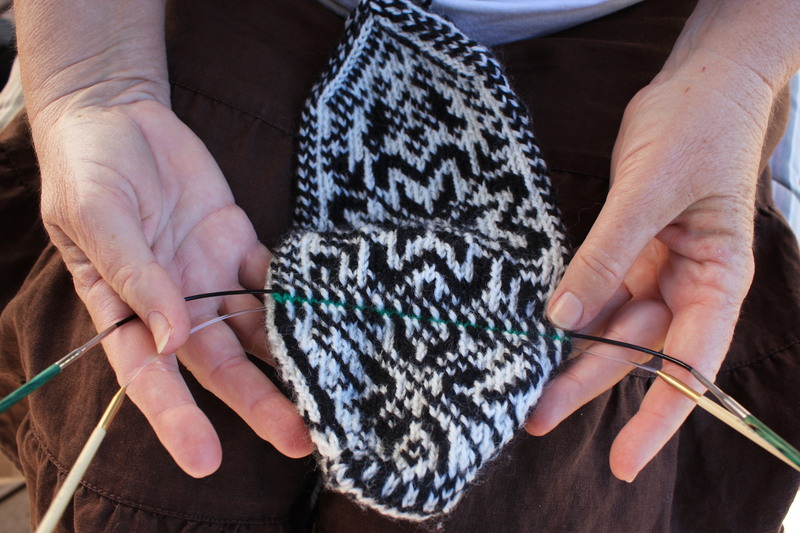 In the slipper project there was a typo when we got to the instep and with one reading and one knitting it was easy to figure out the problem. As we are knitting, laughing, and generally having a marvelous time, people walk by to say “hi” and some to stop and chat. Women want to know about knitting, so we are able to open the world of knitting up to someone new. We both know how to crochet, but prefer knitting. Lunch time, there is a deli next door to The Office which serves one of our favorite sandwiches; hot Santa Fe Chicken on a bagel. It’s hard when we have to pack up and say good-bye for the day. Another perfect day in paradise doing what we love! ~Neither Barb nor I would pass up a knitting pattern we liked that was listed as “Advanced”. As a pack to ourselves this year, each joint project that we do is specifically to learn a new technique – that is new to both of us. 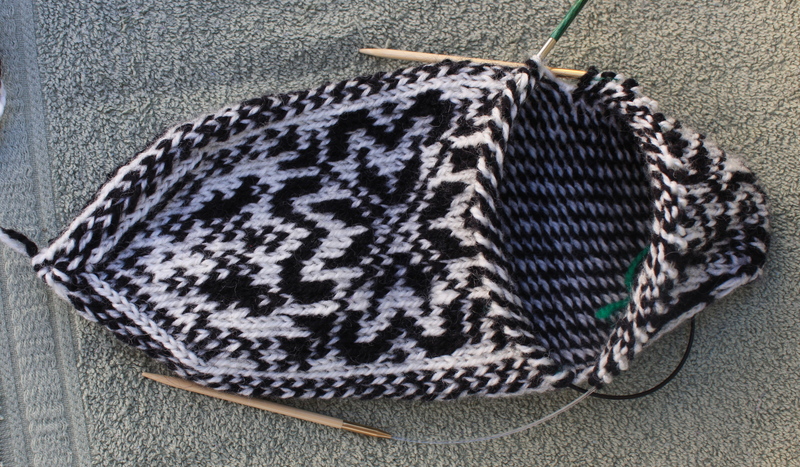 Doing the Norwegian Star slippers, we learned twined knitting. 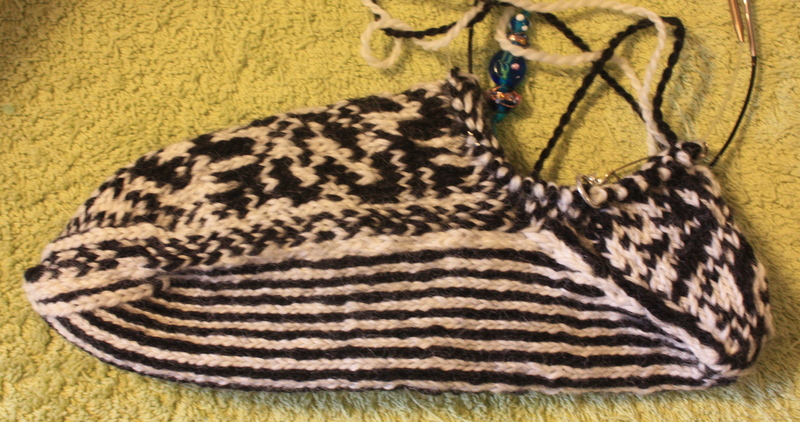 Looking inside of the slipper you can see how twined knitting looks. See that there are not any “carry along” strings. 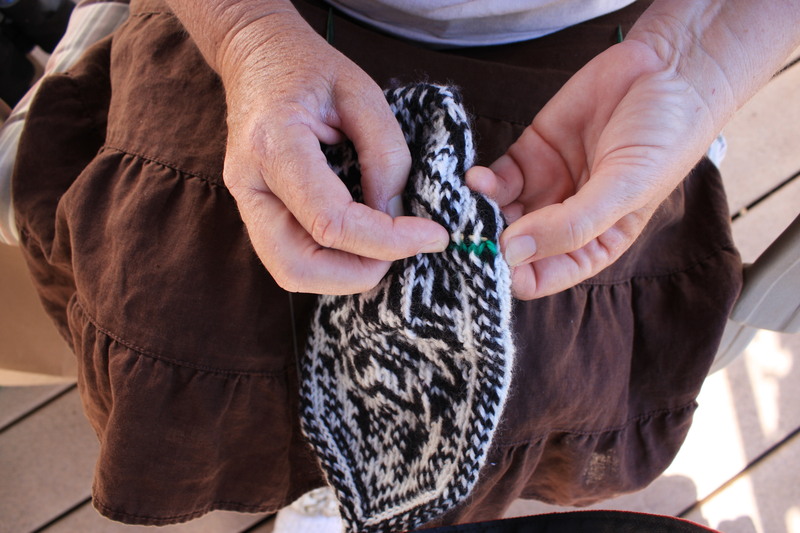 Each stitch gets twined or twisted before it is knit. Our next project that we hope to start this week, is two color brioche knitting. 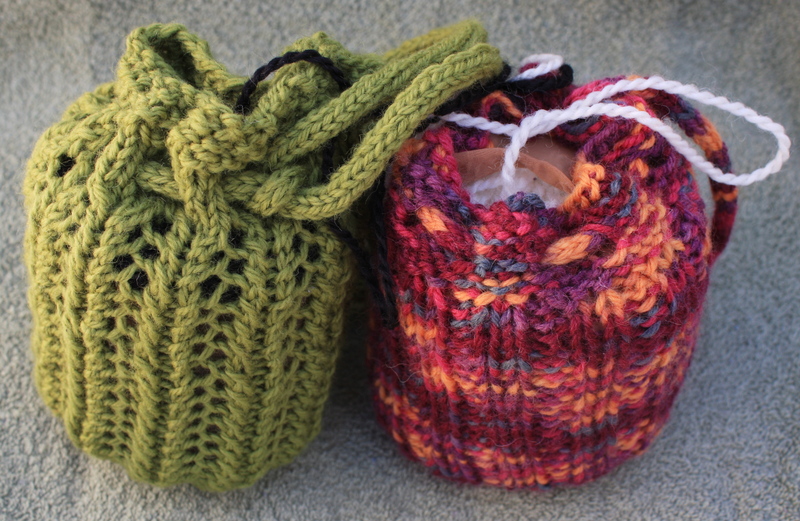 We already have our two balls of variegated yarn. We’ve chosen different color ways. Curls loves the harvest palette and I love the winter palette. If you are interested in learning how to knit brioche, join us! We’re still deciding between a couple of patterns. Barbara has knitted a type of brioche, the Fisherman’s Rib. You can see that in her scarf from the other day. She has not knitted the regular brioche, nor the two color; so this makes it a new technique for her. Let us know if you’d like to join in and we’ll let you know which pattern. Two future projects are a linen stitch scarf and socks. We’ve knit our share of booties, but not socks. I did start one, but it was a BORING pattern so off the needles it came. As we see new techniques, they’ll be added to the projects we must do. So, beyond beginner knitting, a few skill sets we already have, are: lace, cable, enterlac, twined, dropped stitch, cross-over stitches, beaded, Fair Isle, and whatever I can’t think of. Lol! Our mom is/was a wonderful knitter and so it’s in the genes! At 90, she says she just isn’t interested in knitting anymore. I keep offering to send needles and yarn. lol! The Norwegian Star is Shining Brightly! ~Barb and I each have one Norwegian Star. We finally finished one slipper each! Some weeks ago, we shared when we first started knitting this project. I have to say, it is one of the most “painful” projects I’ve ever done! For arthritic hands the tiny #2 needles were sometimes hard to maneuver. And then, following that tiny chart! WOW! When we got together at Barb’s last Thursday, we both had knitted to the point where we needed to add the arch and cuff. 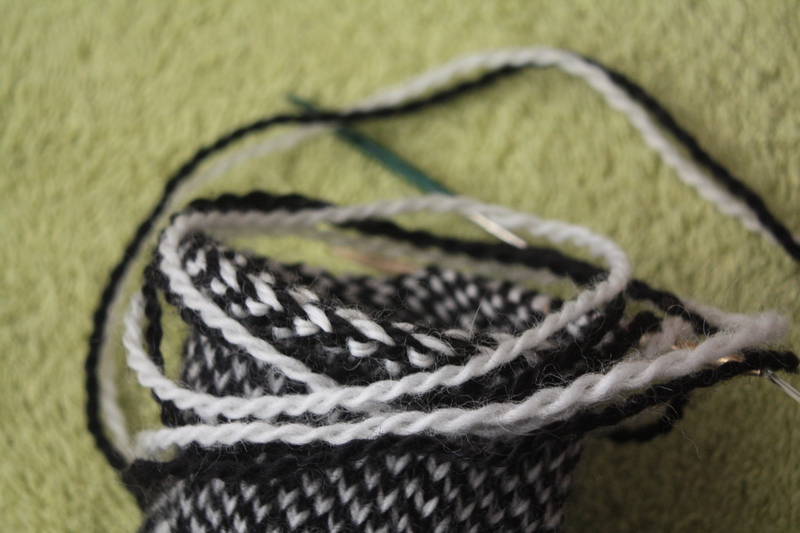 Ah, I knitted to tightly, I was pulling the twisted yarn too tightly. And, pretend you don’t see the stitch that I dropped being held in place by a safety pin! Curls is the best a picking up stitched from waste yarn. She is a machine knitter and there is quite a bit of that when using the knitting machine. Pick up the stitches on the other side and you’re ready to remove the waste yarn. 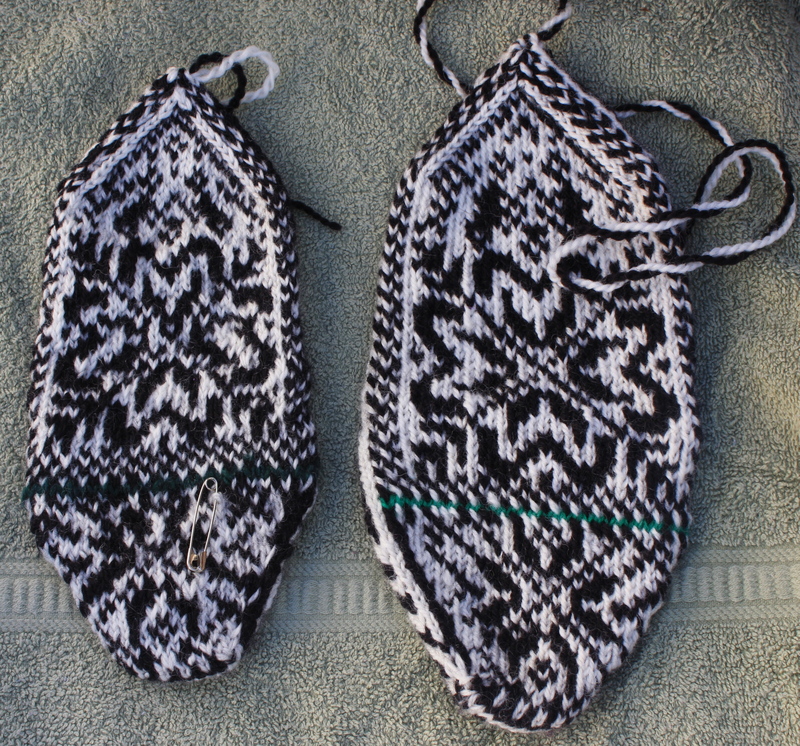 After the waste yarn is removed, it’s easy to see that it is a slipper! We did find a “mistake” in the directions. Of course, we haven’t gone to a website to see if any errata are posted for the Scandinavian Slippers and Socks book. These are the directions: Row 3: Slip 1 st, TK (Twined Knit) to 1 st before marker, remove marker, sl st back, TK2tog tbl, turn, pm. Ok, do it! 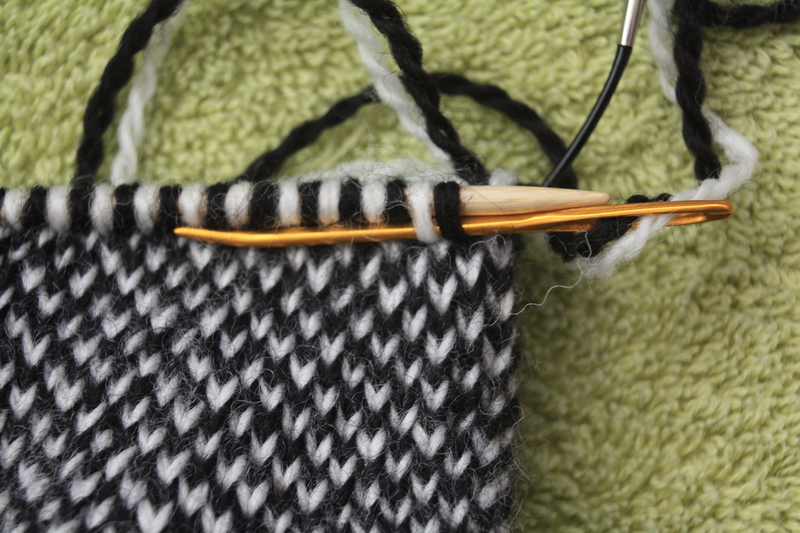 Knit to one stitch before the marker, now try to remove the marker while a stitch is still in front of it. 😎 Instructions should have said: Row 3: Slip 1 st, TK to 1 st before marker, slip stitch, remove marker, slip stitch back onto left needle, TK2tog tbl, turn, pm. We got to that point and it was “What-the-heck”? How can we remove the marker when there is still a stitch on the needle? The patten had that same error consistently in the instructions. That’s why why we knit the “new stuff” on this pattern together. It has taken both of us to translate some of the instructions! Lol. So, save some grief, listen to us! 😎 This arch part is done in short rows, and it really is quite clever. Final lap of the journey. Just black, white, black white – I can do this! I might just have one slipper. This was not a fun project for me! Of course, it was water off of a duck’s back for Barb! 😎 And, I did pick up the dropped stitch. Sigh…… Part of the problem is that because of the twisting, the yarn twists way back onto itself and had caused the two played strands to separate. This makes it difficult to see if there are two stitches or just one. That’s my story and I’m sticking to it! Step Two: Thread needle with yarn. Put needle purl-wise through first two stitches. 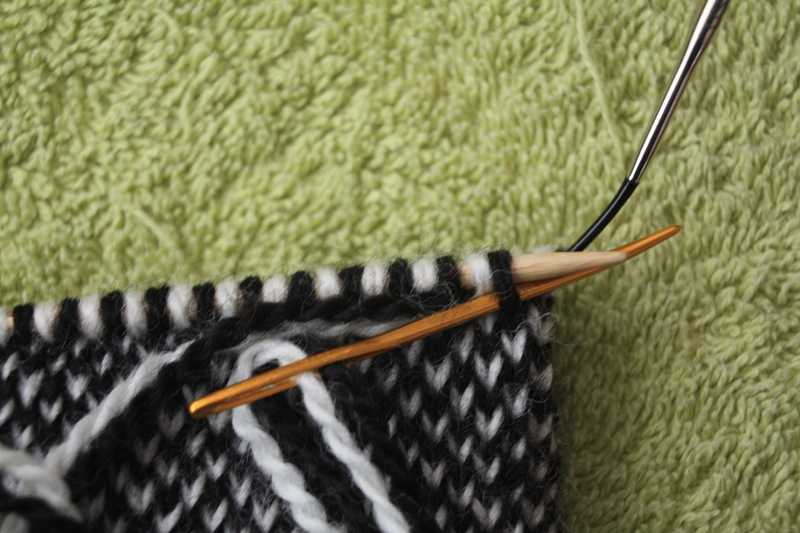 Step 3: Now put the needle back through the first stitch knit-wise. Pull through and take stitch off of needle. Continue around to end. Weave in ends. This is what the twined stitch looks like inside of the work. 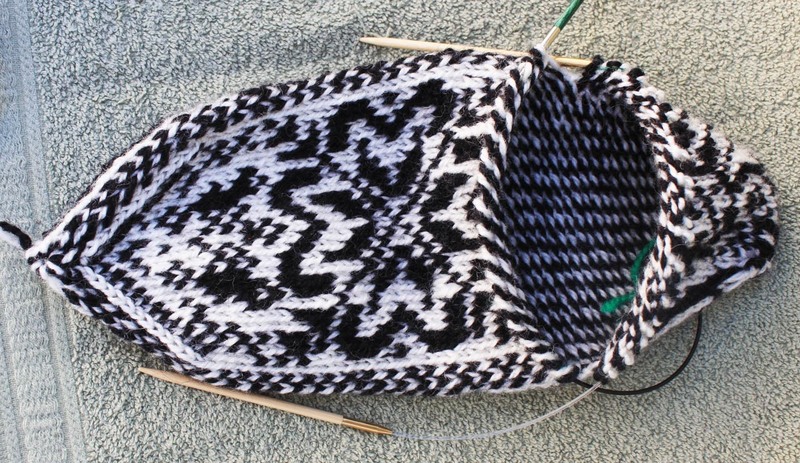 Notice the yarns don’t look like Fair Isle where the yarns are carried along. 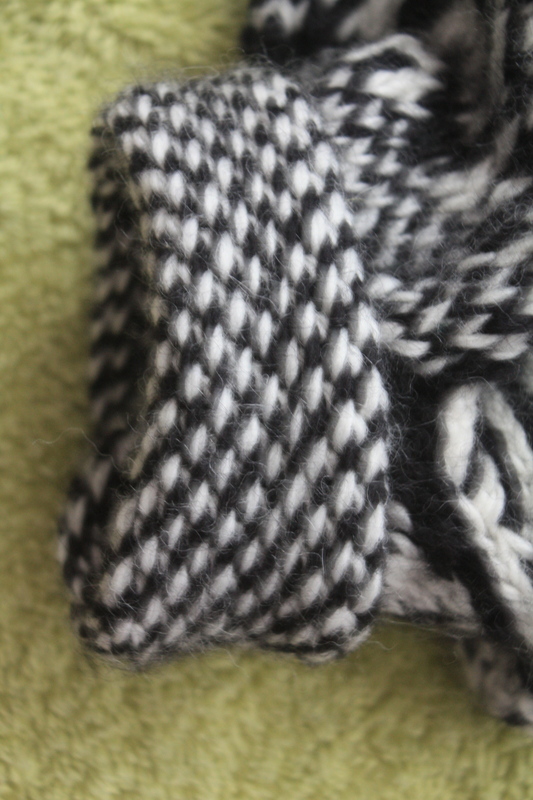 Twined stitch makes a dense fabric. Ta Da! Voila! It’s done! One slipper is off of the needles! Look how good it looks on my foot on Mariah! 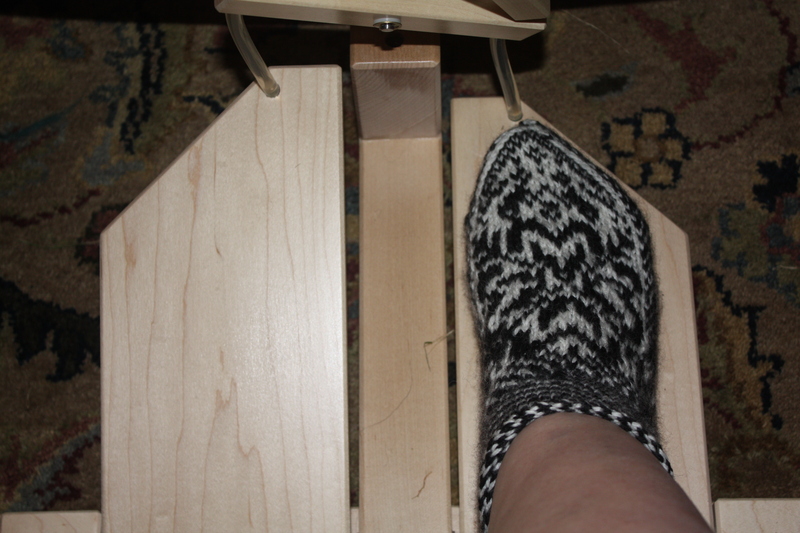 This should become my official spinning slipper! The purpose of our joint projects is to learn some new knitting technique. 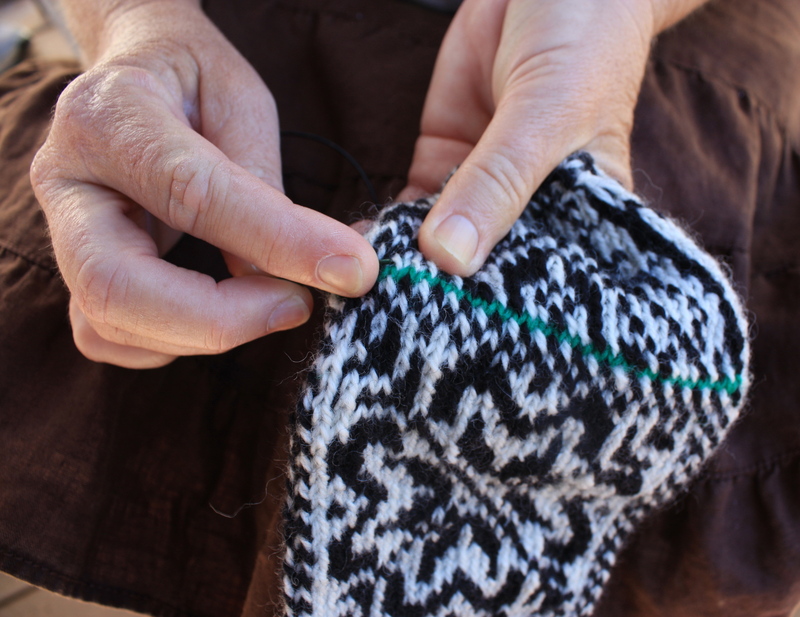 In knitting our Norwegian Star slipper we learned how to: 1. do “Two-Strand Circular Cast On”, 2. twined knit, and 3. bind off withe “Sewn Bind Off”. Part of the joy of knitting is stretching oneself to learn something new! We’re glad to have learned some new tecniques! One tip: I had 2 #4 bamboo needles and Barb had 2 #4 green needles. We traded one needle and made the green one our number 1 needle. Has worked wonderfully well! Both needles are a knitting joy. Two different colored circulars make the knitting so much easier. The shawl is called Maja by Anniken Allis. It’s a free pattern in Knitty, Winter 2008. I’d been wanting to try that “yarn-strands-over” technique. I’ve had this Noro Inspirations yarn Color 5 for a few years and thought this would be the perfect project. 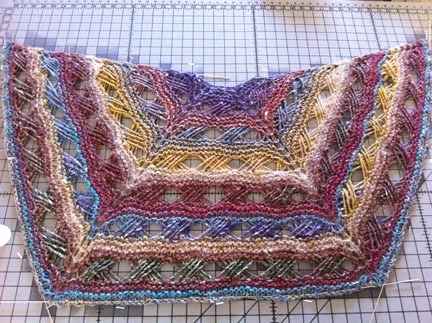 Its a heavier yarn and perfect as a shawlette – I made it smaller than Anniken’s Maja. Please, don’t look too hard for the mistakes! lol! When looking up the info for the blog today I recognized Anniken as a Scandinavian name, checked it out and sure enough she’s from Norway. You’ll see, we just can’t get away from our Norwegian roots! lol! Barb is a fabulous knitter, the better of us two. She inherited mom’s knitting gene. She just finished an extraordinarily wonderful sweater called Herdis by Elsebeth Lavold. The pattern is in Designer’s Choice Book One. Hum, another Scandinavian pattern. I promise, most of what we knit is not Scandinavian! 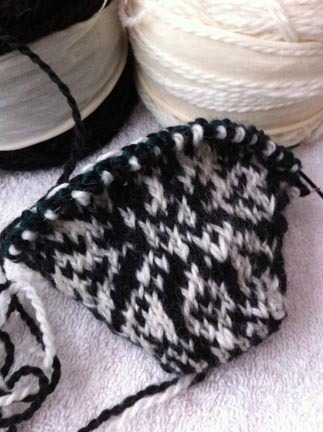 Although my favorite cast-on is the Old Norwegian Method and I purl the Norwegian way. We do have our next project lined up – dang I’m the type of person who wants instant gratification but we made a promise to wait so I’ll be good! Barb did make noises on Monday that she thought she’d try the new technique. I played the older sister card and told her she had to wait! lol! HINT – think Brioche. 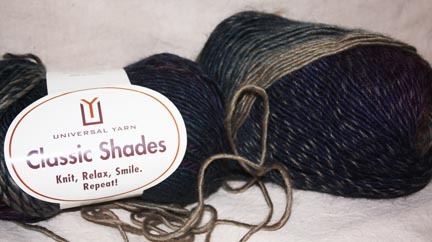 The yarn has been purchased and is silently screaming at me “use me now”.